Grape Madness: Submit Your Bracket Now! The mystery shopper (me) paid a visit to VinoDivino in Newton, MA recently. This was my first time in the shop and I have to say- I was quite impressed with the shop and a number of innovations they bring to wine retailing I've not seen elsewhere. 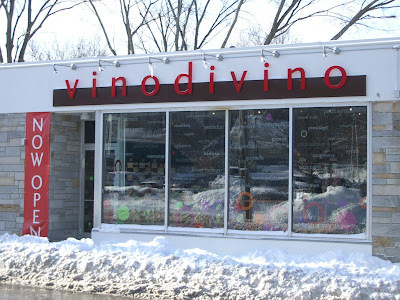 VinoDivino is conveniently located near a Whole Foods Market and it would seem that much of their business comes from customers who come in seeking a recommendation for a wine to accompany their dinner that night. However, as a bit of a point-chasing, value-minded consumer I too found the store to be to my liking. They don't carry nearly as many wines as most shops, but that's not necessarily a bad thing. I found 2 wines I've been looking for: a Siduri Pinot, and a Bodegas Borsao Crianza. 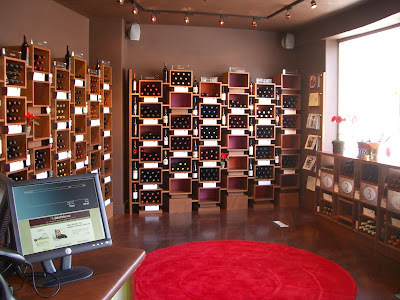 Their smaller selection allows for a deeper knowledge of the wines they do carry. For example, Rodolfo was working the floor the afternoon I stopped in and he was extremely knowledgeable about all the wines in the store and was able to share his opinion that the 2006 Bodegas Barsao was a very similar wine to the highly rated 2005. He also nailed a description of the Siduri advising that it was light in color, yet very flavorful. Each item on the shelf comes along with an information card called a DivinoCard. Here is a link to the DivinoCard for the 2007 Siduri Sonoma County Pinot Noir. And here's one for the 2006 Bodegas Borsao Crianza Selección. As you can see if you click through the links, the cards are packed with useful information about each and every wine they carry. I'm sure it's no easy task compiling the information that goes onto these cards, but as a consumer I do find them to be a very useful touch. A DivinoCard is included for each wine you purchase for later refrence. There is an amazing disparity in how well local wine shops leverage the Internet to connect with their customers. Against this measure, I'd rate VinoDivino solidly above average. Their online store accurately represents their in-store product mix, they maintain an E-mail list with useful notifications of specials, and most importantly they have an e-commerce site. They also take your E-mail address and send you soft copy DivinoCards for the wines you purchase. They're green like that. I thought this was a really nice and useful touch. I have a pet peeve with many local wine shops: They're careless with the wine they sell. Whether it's dusty bottles or torn labels, I don't like spending my hard earned money on something I need to spruce up once I buy it. Particularly when I purchase a wine that I plan on cellaring for a while, I don't like it when the label is torn because it's been mistreated in the shop, or packaged poorly for taking home. Against this measure, VinoDivino performed very well. Each of the two bottles I bought were wrapped in tissue paper, secured with a VinoDivino label and placed securely in a nice paper bag with DivinoCards. Well done. It's a small thing, but I appreciate it. The Connoisseurs Club is VinoDivino's loyalty program. For every $200 you spend, you get a $10 store credit (effectively an additional 5% discount). This is the only Boston area wine store that I'm aware of offering a frequent shopper discount. I'd prefer to see all of the available professional ratings on the DivinoCards, not just the highest score available. It's not too difficult to find *some* publication that will give a wine 90 points if you look hard enough, and providing all of the ratings would give me easy access to all the information I'd need to make an informed decisions. Overall, this is a minor gripe since VinoDivino is probably the most forthcoming and consistent of any store I've seen in terms of providing professional rating information. Okay, the margins aren't razor thin. The Siduri Pinot is listed in Wine Spectator's database as having a release price of $20 and it's $25 at VinoDivino. However, the Bodegas Borsao is $16 in Wine Spectator's database and is also $16 in-store. Typical quantity discounts apply, but the prices aren't the lowest I've seen. That said, in my opinion wine deals aren't so much determined by the price you pay relative to release price. Rather, it's the quality of the wine you get relative to what you paid for it. In other words, it's more important to choose quality wines (with the help of a reputable local wine store) than quibble about margins. And heck- I'm willing to pay for service. These guys will even deliver your wine to your car if you call ahead! It's a shop that I plan on spending more time exploring in the future. Thanks to their useful web site, I can check their inventory without visiting the shop. And thanks to their convenient location near Whole Foods I can stop in and poke around next time we're doing our weekly shopping. Check back later for a follow-on piece discussing the two wines I bought at VinoDivino. Want another opinion? Check out this review of VinoDivino from The Passionate Foodie, an excellent Boston area food and wine blog. Do you like reading authentic Mystery Shopper reviews like this? Then you might also enjoy the similar review I did of Brookline Liquor Mart's E-mail Offers. And if you really like what you see here, you might like to subscribe to The Wellesley Wine Press. Question of the Day: What do you think of VinoDivino?